The Indian aviation sector has an envious track record with one of the world's fastest growing aviation markets. With a rise in air travel, the domestic aviation market has tripled in the past five years, according to International Air Transport Association (IATA). Domestic airlines carried 24.5 million passengers compared to 21 million during the corresponding period of previous year, a growth of 17.6 per cent. Riding high on the aviation boom, India has built 17 international airports. This is the busiest airport in India terms of daily flight traffic. 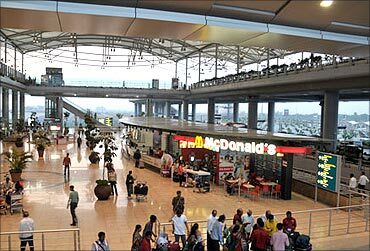 With the swanky new Terminal 3, Delhi's Indira Gandhi International Airport has become an important aviation hub, with a current capacity of handling more than 46 million passengers. The airport expects to have a capacity to handle more than 100 million passengers by 2030. The Terminal 3 is the world's eighth largest passenger terminal. The airport received the fourth best airport award in the world (in the 15-25 million category) and 'Best Improved Airport' in the Asia-Pacific Region by Airport Council International. One of South Asia's most notable aviation hubs, the Mumbai airport handled more than 29.1 million passengers and 670,235 tonnes of cargo in 2010-2011. 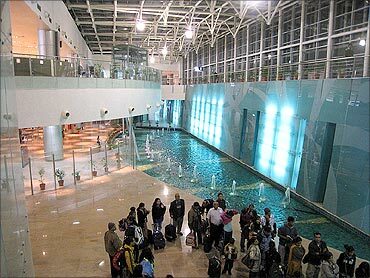 It is the second busiest airport in terms of passenger traffic in India. The airport, with its five operating terminals is spread over an operational area of 1,450 acres. Image: Chhatrapati Shivaji International Airport (Mumbai). The Hyderabad International Airport has been ranked as the world's best airport for the second year in a row among 49 airports handling 5-15 million passengers per annum. The airport near Shamshabad replaced the former international airport at Begumpet in March 2008. 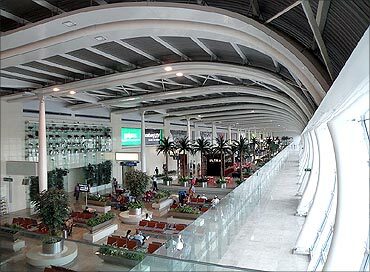 The Rajiv Gandhi International Airport is the second airport built in India on a public-private partnership. It was the sixth busiest airport in the country in terms of international and overall passenger traffic, during April 2008 to December 2010. The Hyderabad International Airport was ranked the fifth best airport globally by Airports Council International in February 2010. 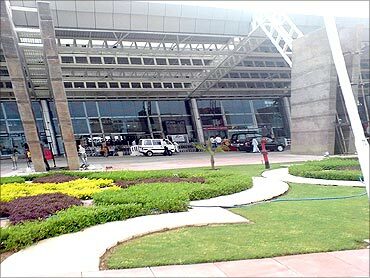 Image: Rajiv Gandhi International Airport. Spread across 4,000 acres of land, the impressive airport replaced the old HAL airport in Bengaluru. It was the fourth busiest airport in the country in terms of overall passenger traffic of 11.59 million and fifth busiest in terms of international passenger traffic during the financial year 2010-11. 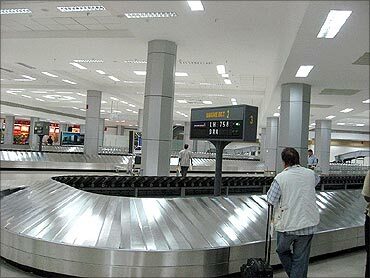 The airport is expected to handle 17 million passengers in the year 2015. The airport is host to 10 domestic airlines and 21 international airlines connecting the city to about 50 destinations across India and rest of the world. 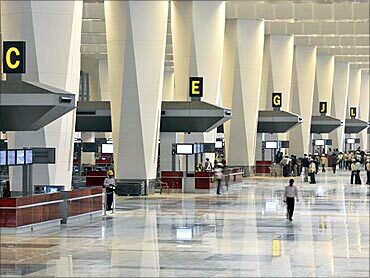 At the Emerging Markets Airports Awards 2010, BIA was awarded 'The Best Emerging Airport' in Indian sub-continent. Chennai has India's third busiest airport in terms of both international and overall passenger traffic. The traffic is expected to double after March 2012 once the expansion is completed. The airport was built on the land donated by former governor of Madras Presidency, L Sriramulu Naidu. The Kolkata airport was the fifth busiest airport in the country in terms of overall passenger traffic and ninth busiest in terms of international passenger traffic from April 2006 to Dec 2010. The airport is building a fourth terminal to handle the huge increase in passenger traffic. 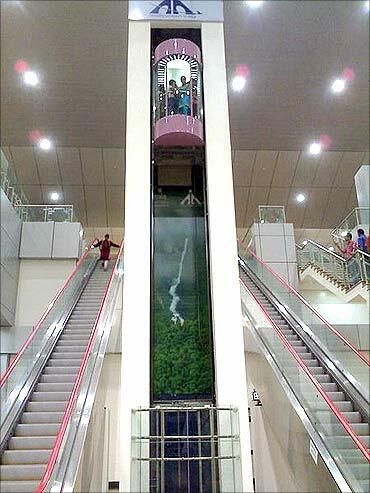 Image: Netaji Subhash Chandra Bose International Airport. 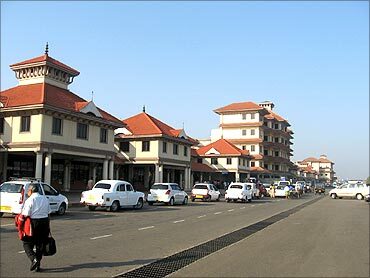 It is the largest and busiest airport in Kerala. 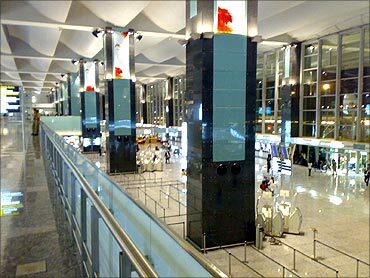 It was the seventh busiest airport in India from April 2006 to December 2010 in terms of overall passenger traffic and fourth busiest in terms of international passenger traffic. Cochin International Airport is the first airport in the country to be developed under a public-private partnership (PPP) model. This is India's eighth busiest airport with an average of 250 aircraft movements a day. The airport is spread over an area of 1,124 acres. Image: Sardar Vallabhbhai Patel International Airport. The Goa International Airport is spread over an area of 1,700 acres. 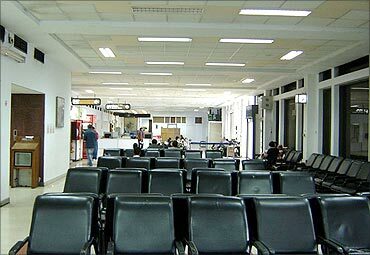 The Goa airport is one of the few profitable airports managed by the Airport Authority of India. 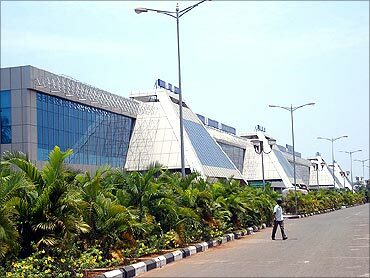 Thiruvananthapuram airport is the first international airport in a non-metro city in India. It is the 8th busiest airport in the country in terms of international passenger traffic and tenth busiest in terms of overall passenger traffic. It is the second busiest airport in Kerala in terms of domestic and international traffic after Cochin International Airport. 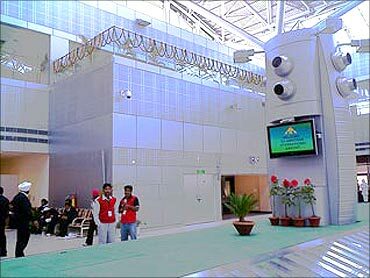 Jaipur airport is the only international airport in Rajasthan. It was granted the status of international airport in December 2005. There are plans to extend the runway to 12,000 ft (3,658 m) and expand the terminal building to accommodate more passengers. Srinagar International Airport has been named after the Kashmiri saint, Sheikh Noor-ud-din Noorani, popularly as Sheikh-ul-Alam. The airport has been revamped with a host of new facilities. 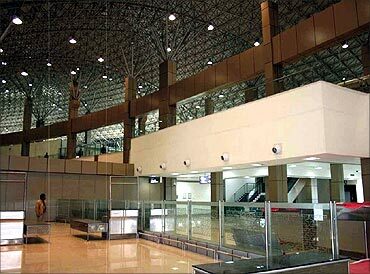 A new terminal for departure and arrival, aero bridges and other operational facilities were inaugurated in 2009. The airport currently handles about 101 commercial flights (international and domestic) in a week. The airport is named after Guru Ram Das, the fourth Sikh Guru. Image: Sri Guru Ram Dass Jee International Airport. 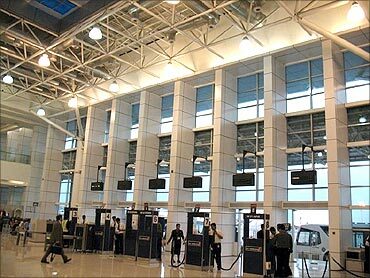 Guwahati International Airport, managed by Airports Authority of India is a major hub for flights to North-East India. The airport has been named after Gopinath Bordoloi who was a freedom fighter and also the first chief minister of Assam after independence. Image: Lokpriya Gopinath Bordoloi International Airport. The airport connects Nagpur to India's main aviation hubs of Mumbai and Delhi, as well as the international destinations like Sharjah and Dubai. This airport is slated to be the multimodal international hub airport, which will reduce the overload on other busy airports in India. Image: Babasaheb Ambedkar International Airport. 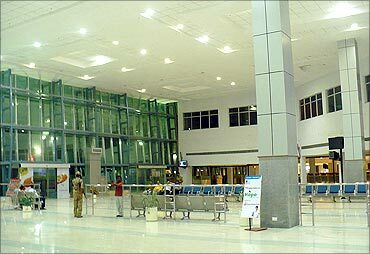 The third International airport in Kerala, the airport serves north Kerala. Air India Express has a base at the airport. The airport was given the international airport status in February 2006 after it enhanced infrastructural facilities for handling international flights. 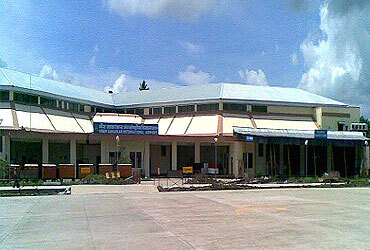 Named after the Indian freedom fighter Vinayak Damodar Savarkar, Port Blair airport received the international status in 2007. It is managed by the Airport Authority of India. Its runaway stretches to distance of 3,290 metres (10,794 feet). 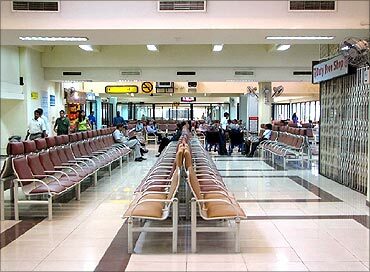 Image: Veer Savarkar International Airport. Will India ever get such SUPERB trains?